Also known as chloasma, melasma is a skin condition related to hyperpigmentation that has to do with the darkening of the skin caused by the excessive production of melanin. More often found in women – particularly in cases of pregnancy and women taking oral contraceptive drugs that can affect hormonal activity throughout the body. The disorder has been known to produce discolored and darkened skin patches most commonly on the cheeks, nose, forehead or lips. Although the condition is largely a harmless type of pigmentation disorder, it can present uncomfortable cosmetic drawbacks, particularly because the dark spots it produces tend to appear most often on the face than anywhere else on the patient’s skin. Researchers believe the disorder is caused by unbalanced levels of estrogen and progestrogen influencing skin cells in the epidermal layer of the skin to produce more melanin, thus leading to the skin discoloration patterns so prevalent in the case of melasma patients. Additional causes may also have to do with genetics, as well as disorders such as thyroid disease or Addison’s disease. In these cases, other hormones, such as the melanocyte-stimulating hormone (MSH) can also have a lasting impact on the excessive production of melanin. Home remedies and natural treatments are often an easy, cheap and powerful way of getting rid of unwanted dark spots on your face caused by melasma. Lemon juice is one of the most effective topical remedies for this type of hyperpigmentation. Since the dark spots are usually embedded into the outer layer of the skin, the lemon juice’s acidic properties can act as an excellent exfoliating agent that will help you reduce excessive pigmentation within 3-4 weeks. Oatmeal is another natural exfoliator that can act on reducing black or brown spots and dissolving dead skin cells to leave your skin looking smoother and brighter. Turmeric is often used to treat pigmentation issues, and although it is considered to work best on acne and dark spots caused by sun exposure, it is also effective against melasma. If used daily, its natural bleaching abilities reduce excessive melanin pigmentation, and it also has antioxidant properties that can cleanse the toxins out of your skin’s top layer. Onion juice can also be added straight onto dark spots twice a day to reduce blemishes and dark spots caused by chloasma, while also nourishing the skin. For better results, it can also be mixed with apple cider vinegar. 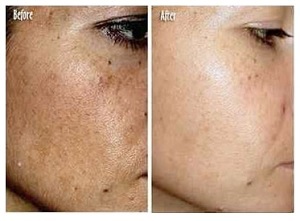 There are many other methods of eliminating dark spots caused by melasma, and although the condition is not harmful or problematic even in the long run, it can sometimes get harder to treat if you wait too many months or years before doing anything about it.